Labor Day 2010 will forever be remembered in Boulder as the day the Four Mile Canyon fire began to burn. Today, two days later, over 7,000 acres and 140 structures (including 9 homes owned by fire fighters) have been consumed by the fire that is still burning. In a sign of a tech-savvy community, residents immediately began flooding Twitter with the hashtag #boulderfire to share information. This proved to be most helpful as we discovered the failure of the 911 callback system designated to alert people to evacuate their homes. It is rumored that once it was clear that the 911 callback system was not reaching home owners, Twitter became the main way to reach people in the evacuation area quickly. As the fire spread, the Humane Society offered newly homeless pet owners a sanctuary for their pets. Again, the news was shared primarily through their Twitter account. Restaurants quickly followed suit with offers of free food and drinks for anyone who was displaced by the fire. People with police scanners or personal views of what was happening rounded out the real time Twitter postings of news while others retweeted posts to help. 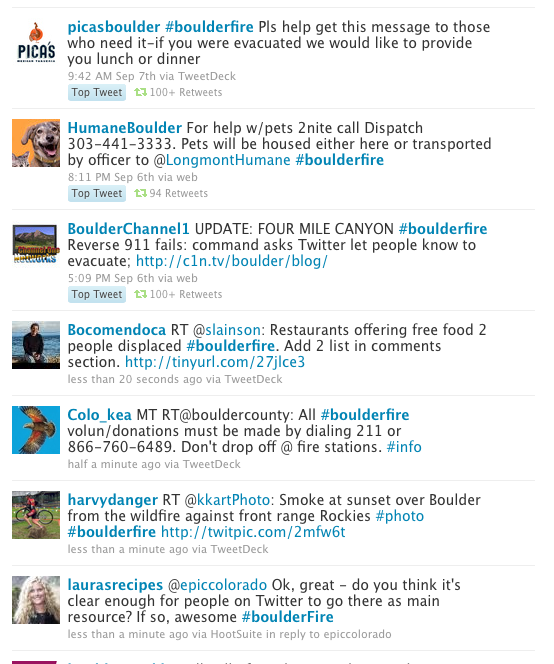 And TweetyGotBack has created a Twitter background to support fire fighting efforts along with a link to BoulderFire.com where you can use the "Offer Help" or "Get Help" buttons in a Craig's List-like system to connect donors with fire victims to get them the items they need. On Facebook the City of Boulder announced community meetings and health warnings. Residents also posted updates on their personal Facebook pages to share helpful news, pictures and You Tube videos of the fire taken by residents. On this third day of the fire, we are still tracking the fire through Google Maps because they have the most detailed information available in one place. This is only possible because community members are generating the content in real time. Google Maps offers the only platform where we can all aggregate shared knowledge in an actionable way. Finally, cloud computing has also come to the rescue in the form of a Google docs editable spreadsheet organizing help by the community and for the community. If that wasn't enough, a Four Mile Fire Help forum is organizing housing help and other resources for fire evacuees. Since Gold Hill residents lost everything, they have started a collection website. They can use anything from clothes and personal hygiene products to toys, bikes, cars, kitchen utensils and almost anything you have laying around as an extra item in your house. We are living in an age where connecting, engaging and building community happen in ways we could not even imagine just five years ago. Tragedies are never easy to weather, but hopefully the prominent role social media has taken in our lives will be one additional way to help, heal and maybe even save lives, when disaster inevitably strikes. All Hazards blog has a larger list of Colorado Wildfire Resources in one place. The Boulder Daily Camera has a good list of How To Get Help and a page with the latest wildfire information. The Boulder Office of Emergency Management launched a comprehensive response page at http://boulderoem.com. Donations for Four Mile Canyon fire victims are being taken by calling either 211 or 866-760-6489. Goods, money and food are also being collected by Volunteer Connection at services@volunteerconnection.net or 303-413-7737.